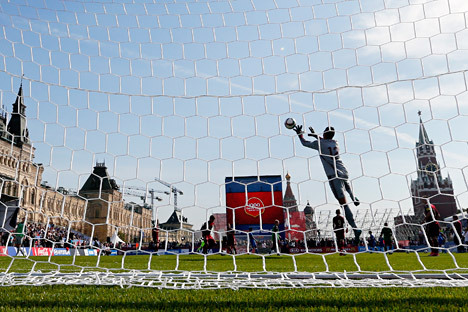 Soccer players perform at a soccer park installed at Red Square before the unveiling ceremony for the clock counting down 1000 days to go until the 2018 FIFA World Cup at the Manezhnaya square in Moscow, Russia, 18 September 2015. With 1,000 days to go before Russia hosts the Football World Cup, soccer stars and former World Cup champions passed the ball around the iconic Red Square to kick off celebrations in anticipation of the 2018 mega-event. A clock to count down days to the start of the football World Cup 2018 has been officially launched in the heart of Moscow. Igor Akinfeev and Alexander Kerzhakov, players from Russia’s national team, took part in the ceremony on September 18, with exactly 1,000 days to go for the World Cup to kick off. A football field was constructed on Red Square, where youth teams from Germany, Italy and Spain; the last three World Cup-winning nations; competed. The Russian national team was in attendance as representatives of the World Cup's host country. Honoured guests at the tournament included Lothar Matthaus, Gianluca Zambrotta; German and Italian champions; as well as Fernando Hierro, the famed Spanish footballer who has played in four World Cup teams. "It's hard to come up with a better idea of marking 1,000 days to the start of the World Cup than to hold a football tournament," Colin Smith, FIFA's director of competitions, said in an interview with the Russian news agency TASS. "Any outcome from the Russian national team at the World Cup could be expected, including its victory,” said Lothar Matthaus, a player on Germany’s 1990 national team that won the World Cup. “The team has a new coach, it is formed by good players and it will be playing on its own turf." The FIFA World Cup will be held in Russia from June 14 to July 15, 2018. Eleven cities will host the championships, while the final will take place at Moscow's Luzhniki Stadium.